Occy’s Grom Comp kicks off at Duranbah Beach on June 29th, marking the 10th running of the event that brings together 230 competitors who will compete across five divisions from Australia, Indonesia, New Zealand, South Africa, Tahiti and Europe. A horde of Le-Ba's finest grom surfers are at the event warming up for the SkullCandy Oz Grom Open. Good luck groms. Luke Condon had a win in the 14's boys today in clean 2' - 3' D'Bah peaks. Mikey McDonagh and Eli Carr both progressed thru to round 2 in the 12's boys. Heat wins for Mikey and Eli today moving into the Quarters in the U12's in clean head high D'Bah peaks. Luke made it through his 2nd heat and into the final 16. Luke was unlucky today holding the lead until the final 2 mins but was eliminated to finish in 9th. Rhys Tatum, Dan Boardman, Reagan Martinovich and Blake Ghanimeh were sent out today just before the event was put on hold due to the near cyclonic conditions and unfortunately knocked in the U16's. Congratulations Mikey McDonagh winner in the U12's. 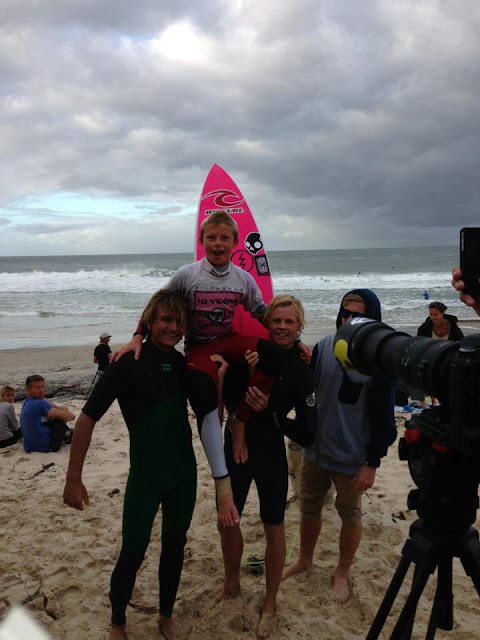 Mikey comboed the field for a decisive win in solid conditions. Eli was ripping and unlucky to exit the event in the quarters.